The Energizer Bunny is ready for his Snapchat close-up just as Energizer Holdings Inc. and creative agency Camp + King launch two new :15 holiday-themed ads from the “Bigger, Better, Bunnier” campaign, which debuted in September. The first spot, “Naughty/Nice,” which broke across broadcast, cable and online channels, shows the fluffy pink character with his now familiar sunglasses and flip-flops—items introduced in the September spots. 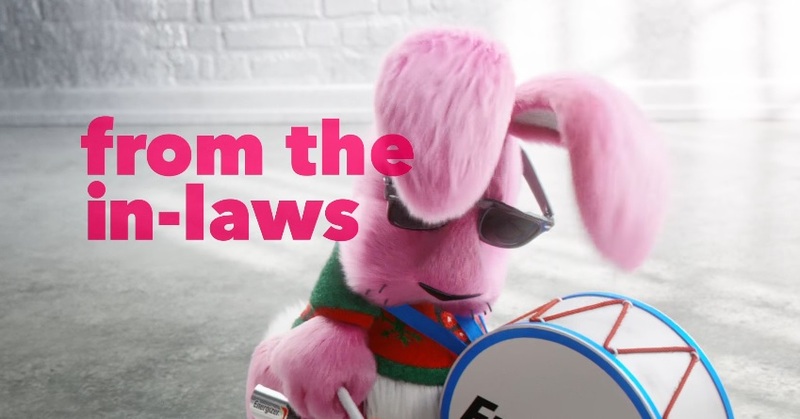 In the new video, the Energizer Bunny snatches off his sunglasses, revealing another pair underneath as the word, “naughty” flashes on screen. Next, he marches and pounds his drum using candy canes for drumsticks. “Nice” flashes on screen, followed by “nonstop” as he glances winningly over his shoulder. The Bunny signs off by peeking into frame sideways with a cheeky, knowing look on his face as the tagline appears, “Still Going!”. In the spot “In-Laws,” we see the Energizer Bunny dressed for the season in a holiday sweater as “Lasts longer than” fades in. Then his body sags slightly as a doorbell rings and the rest of the line appears: “a visit from the in-laws.” But undaunted, the Bunny picks up his step and mood while marching to answer the front door. In September, Camp + King worked with production house The Mill to give the Bunny a makeover that struck a balance between a realistic and stylized look. The VFX & Design team gave the Energizer Bunny plush CG fur and lit the character model to add a layer of realism in the CG environment. Updated animation also gives the Bunny a greater range of movement and personality. In modernizing the Energizer Bunny for the September launch, Camp + King and The Mill revised the character’s design to match the progression of the brand. They dialed up the animation but retained elements of his original form as a battery-powered toy and, most importantly, brought more of the Bunny’s personality to life than ever before.